I have some good news to announce. In case if you haven't read the bulletin, you've got some quick catching up to do: read here how we'll soon be seeing a new rhodium coin by The Cohen Mint! 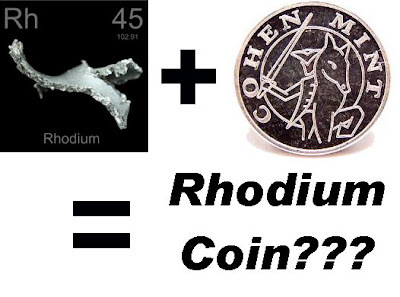 That's right, Eiten Cohen of Cohen Mint and his coinage engineers have finally perfected the formula to mint rhodium--a brittle, hard to work with metal--into 1 gram coins! How did they do it? How much will the coins cost? How can we get our greedy little hands on some of them? 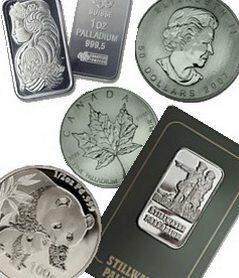 All of these questions will soon be answered in a personal interview with Eitan Cohen of Cohen Mint right here on buy-palladium.blogspot.com! Are you excited? C'mon, I am! Sure, talking to Mr. Cohen is great for sure, but getting our hands on some of those rhodium bullion coins is all of our goal! Mr. Cohen and I will be discussing some of his rare palladium coins. These palladium coins are as small as 1/4 gram. That means you need 125 of them to make an ounce. Rhodium bars are non-existent for investors, but Mr. Cohen will explain how Cohen Mint has finally produced Rhodium 1 gram coins. Check back in a week or two for the full interview with me and Eitan Cohen right here on buy-palladium.blogspot.com.